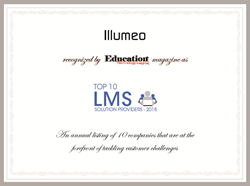 Illumeo Recognized as a 2018 "Top 10 LMS Solution Provider"
Illumeo recognized by a panel of experts at Education Technology Insights magazine as a "Top 10 LMS Solution Provider" for 2018. Illumeo is growing rapidly, bringing their ‘LMS for CPE’ to new markets across the globe while expanding their feature set. Illumeo is immensely proud to announce that we have been recognized by Education Technology Insights magazine as a "Top 10 LMS Solution Provider" for 2018 by a panel of distinguished CEOs, CIOs and analysts comprising Education Technology Insight’s editorial board. The magazine notes Illumeo's unique position as, "The LMS for CPE". This recognizes the distinct qualities brought together by Illumeo of 1) a massive, built-in library of over 1,000 courses with focused content for professionals in audit, accounting, finance, tax, and related disciplines, 2) the provision of Continuing Professional Education (CPE) credit for over two dozen different varieties of professional certification, and 3) a cloud-based, enterprise-class Learning Management System (LMS) with all of the capability that discerning large companies require in their learning platforms. "We are thrilled that Education Technology Insights magazine has recognized what our global clients have been saying for years - that Illumeo is simply a game-changer when it comes to modern-day learning for audit, accounting, corporate finance and related professionals," says John Kogan, Co-Founder and CEO of Illumeo. "We're helping these professionals survive their day-to-day learning challenges and thrive in careers based on rapid acquisition of highly complex knowledge." Illumeo is the LMS for CPE. For millions of corporate professionals, getting top quality professional development with continuing education credit is an expensive and time-consuming struggle, typically with little support from their company beyond reimbursement. With Illumeo, companies can offer world-class learning that brings over two dozen types of CPE (Continuing Professional Education) credit, covering a wide variety of accounting, finance, HR and other certified corporate professionals. Incorporated in 2009 and based in Silicon Valley, CA. The platform is used at some of the largest companies in the world, serving thousands of corporations and corporate professionals. Better content. Better visibility. Enterprise scalability. Lower cost. Illumeo is the LMS for CPE.